Volvo Unveils Innovative Self-Parking Car! Volvo has been working on autonomous vehicle prototypes under its SARTRE road train project for a while, and now the company has revealed a new technology that enables cars to park themselves! The self-parking Volvo concept car is able to find and park in a vacant space by itself, without a driver inside. The driverless car is also able to drive itself while navigating around other cars and pedestrians. 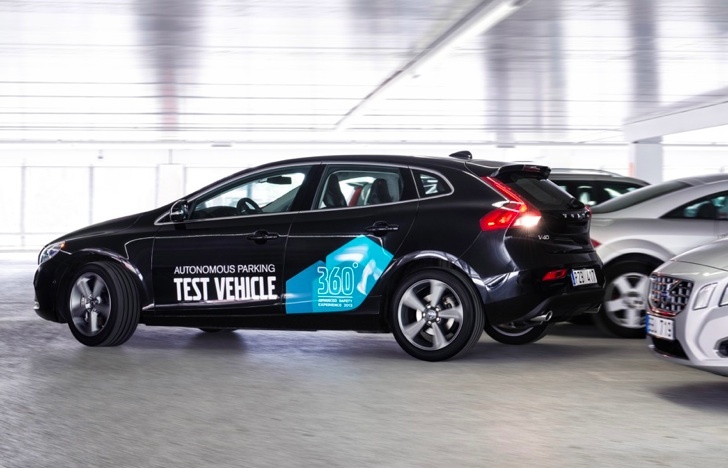 The self-parking car concept looks almost identical to the production Volvo V40, but ingeniously placed sensors and electronics help navigate the vehicle to a free parking space. The system is able to work thanks to road infrastructure that informs the driver when the service is available. The driver uses a mobile phone application to activate the Autonomous Parking and then walks away from the car. “Autonomous Parking is a concept technology that relieves the driver of the time-consuming task of finding a vacant parking space. The driver just drops the vehicle off at the entrance to the car park and picks it up in the same place later,” says Thomas Broberg, Senior Safety Advisor Volvo Car Group.